Democratic presidential candidate former Secretary of State Hillary Clinton and Democratic vice presidential candidate U.S. Sen. Tim Kaine (D-VA) greet supporters during a campaign rally at Florida International University Panther Arena on July 23, 2016 in Miami, Florida. 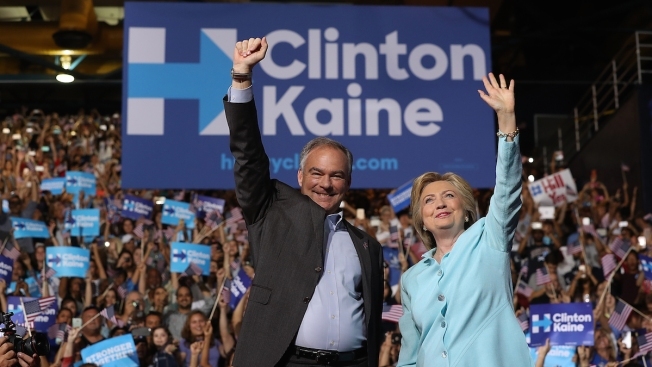 Hillary Clinton and Tim Kaine made their first public appearance together a day after the Clinton campaign announced Senator Kaine as the Democratic vice presidential candidate. Hillary Clinton's running mate, U.S. Sen. Tim Kaine of Virginia, has been described by critics as a snoozer of a choice who could fail to inspire the more liberal wing of the Democratic Party, blue collar workers and others. But friends and former staff say the caricature of a vanilla Kaine is far off base. Instead, they describe a deep thinker with a light touch -- a person who reads dense books on philosophy for fun but also jams on harmonica with any band that will let him play along. "He's a lot of things, but boring isn't one of them," said Beau Cribbs, a former personal assistant who spent long days with Kaine when he was governor of Virginia. Friends and supporters believe Kaine's varied interests and personal background -- he's a Harvard Law grad with a blue collar upbringing who served as a Catholic missionary -- will help him connect to voters around the country. But they say what's most appealing is that he's not wedded to a political life. "He does not need anybody's title," said Tom Wolf, a former law partner and longtime friend. "You could sit next to him on a cross-country flight, and he would never tell you that he was a Virginia governor or a U.S. senator." Supporters said Kaine is motivated by deep convictions and his Roman Catholic faith. Wolf said one of Kaine's personal heroes is Dietrich Bonhoeffer, the German theologian who was part of a resistance movement against the Nazis. "I do what I do for spiritual reasons," Kaine, who declined an interview with The Associated Press, said on C-SPAN last month. That grounded approach has helped explain Kaine's appeal in swing-state Virginia, where he served as governor from 2006 to 2010 and was elected to the U.S. Senate in 2012. It's also partly why Clinton picked Kaine as her running mate. In 2007, Kaine's remarks at Virginia Tech the day after one of the worst campus shootings in modern U.S. history won wide praise. "It really, really had an impact on me in regard to what kind of person Tim Kaine was," said retired state Sen. John Watkins, a Republican. "He spoke from the heart and I think he really spoke for the people of Virginia." Kaine speaks with ease while campaigning, rarely using a prepared text. He's fluent in Spanish, thanks in part to a year in Honduras as a Catholic missionary before graduating from law school. He is open about his faith and its impact on his views on social justice. He and his wife, Anne Holton, are longtime members of Richmond's St. Elizabeth Catholic Church, a predominantly black congregation in a poor part of town. As a private attorney before entering politics, he advocated for fair housing. He has said he personally opposes abortion, but that the government should not interfere with a woman's right to make her own decision. Born in St. Paul, Minnesota, in 1958 and raised in a Kansas City suburb, Kaine grew up working in his father's welding shop. He came to Virginia after meeting Holton at Harvard. She is the daughter of former Virginia Gov. A. Linwood Holton Jr. and serves as Virginia's secretary of education. They have three children; their eldest son, Nat, is a Marine. Kaine has had a somewhat charmed political rise. After serving as a Richmond city councilmember and part-time mayor, Kaine became the Democratic nominee for lieutenant governor when the presumed candidate dropped out following a cancer diagnosis. His election to the Senate was only possible because the incumbent, Democrat Jim Webb, unexpectedly decided to leave after one term. But his political career hasn't been without setbacks. Kaine asked the Justice Department to transfer a German diplomat's son from Virginia to a German prison days before he left office as governor. Kaine secretly agreed to a plan that would have kept Jens Soering behind bars in Germany for at least two years. Soering is serving two life terms for the 1985 slayings of his ex-girlfriend's parents in Bedford County. Kaine's successor, former Gov. Bob McDonnell, revoked that request soon after taking office. And when he was mayor of Richmond, Kaine caught heat from gun activists after using city funds to transport participants to the Million Mom March gun control rally in Washington, D.C. Kaine later raised private money to reimburse the city. There also has been some controversy over paid travel and gifts he received while in office. The gifts were legal under Virginia's ethics rules. Beneath the nice-guy image, friends said Kaine isn't afraid of throwing elbows while campaigning and has a strong competitive streak. He's shown he can win close elections in a swing state, including a bruising and expensive Senate contest. And since arriving at the Senate, Kaine has been working to expand Congress' role in voting for and declaring war, an effort that put him at odds with the White House. Kaine is a close ally of President Barack Obama, who considered Kaine as his running mate in 2008. And maybe most important of all this election cycle, friends say Kaine can take a punch too. When Kaine would take hits from Republicans or the media when he was governor, Cribbs said Kaine would often jokingly put on Elvis Costello's "Blame it on Cain," in car rides. Kaine also blows off stress with his harmonicas, which he almost always carries with him. "He's not like a virtuoso, but he can carry a tune," Cribbs said.